The crazy log cabin design is a series of irregular squares inside other squares or rectangles, each with varying angles and sizes. 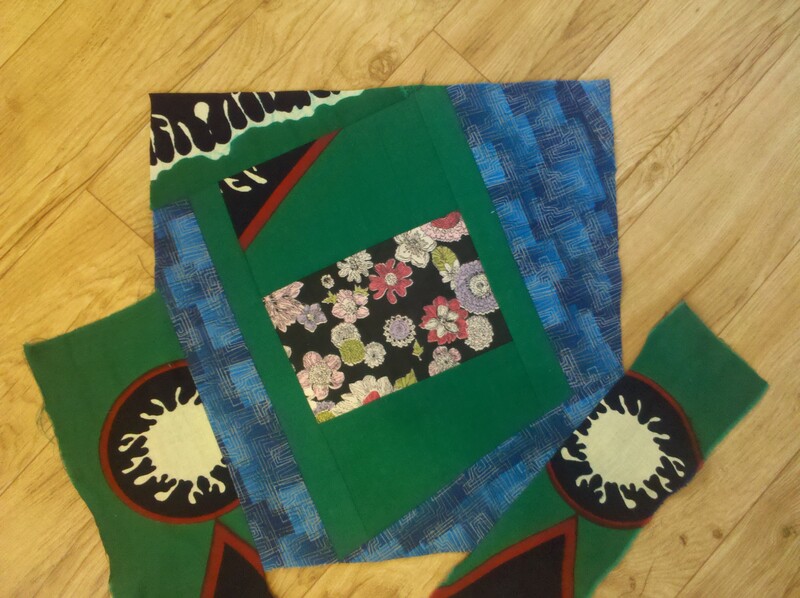 It is fast, fun, very improvisational, and a great project for beginning quilters or sewers getting started in quilting. 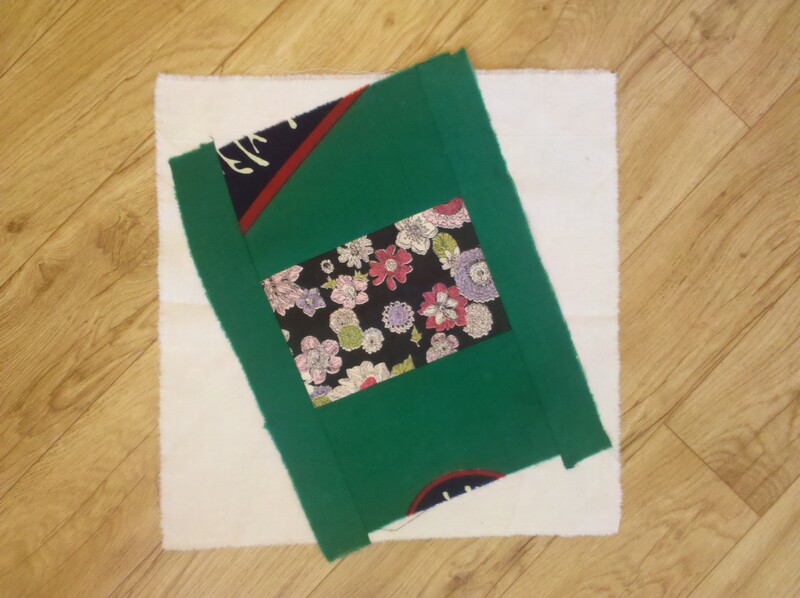 This approach uses a backing that all pieces are attached to, so it is much easier to keep the square evenly flat and smooth. 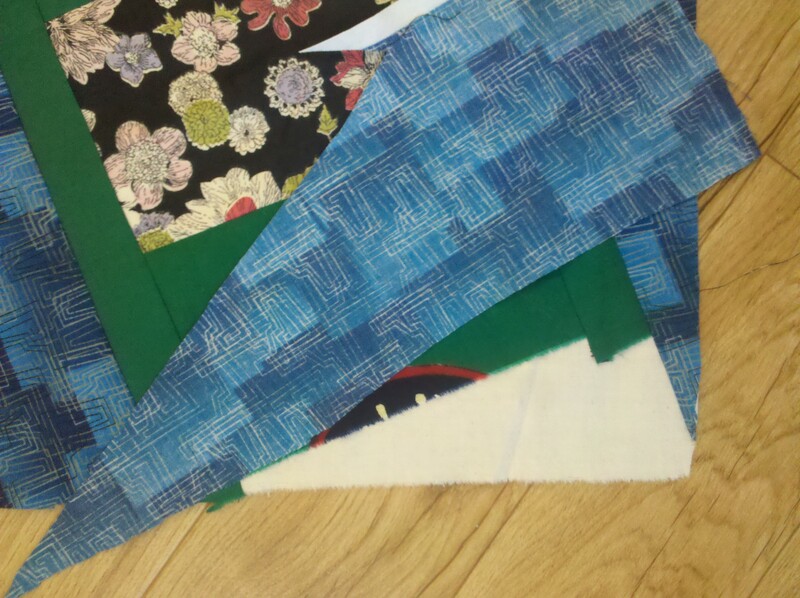 Check out these photos from a group using this technique – none of whom had ever sewn or quilted. 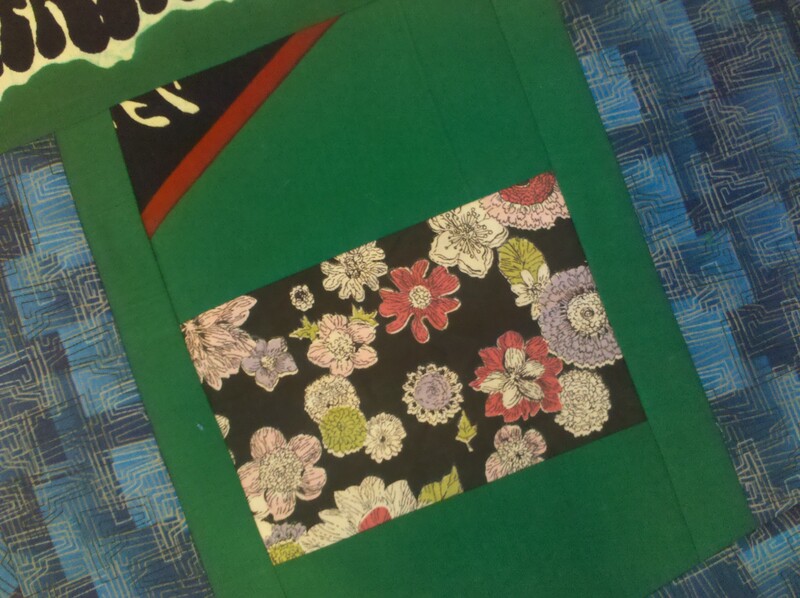 Also great for the more experienced quilting rebel: no measuring, no precise sewing, and very little planning make this project an easy way to experiment with color and shape in unexpected ways. If you don’t like following rules, this may be just the thing for you. 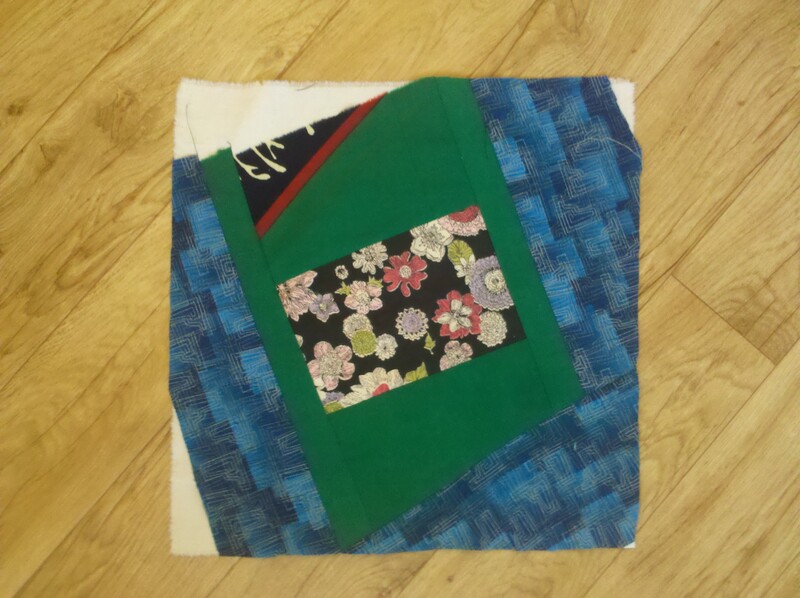 You can make your crazy log cabin square as crazy as you like or as squared as you like. 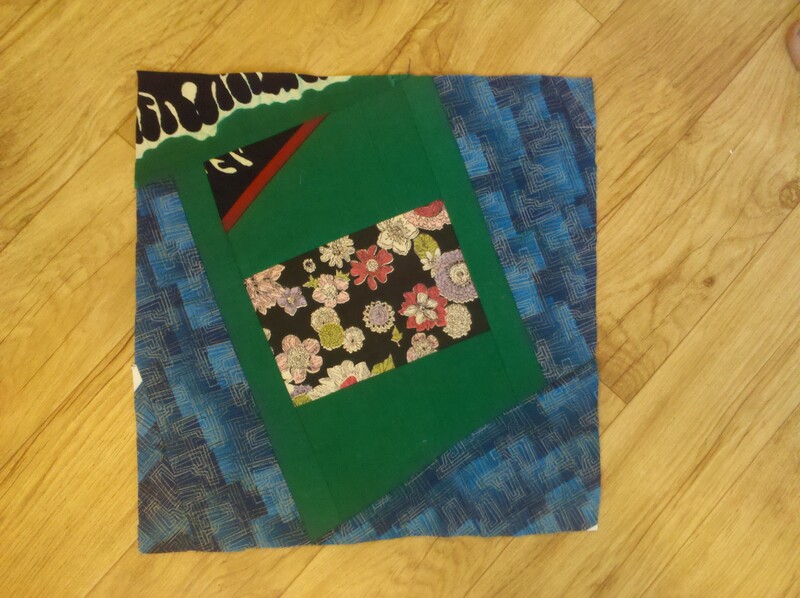 Use up fabric scraps and make a beautiful improvisational quilt square in no time. 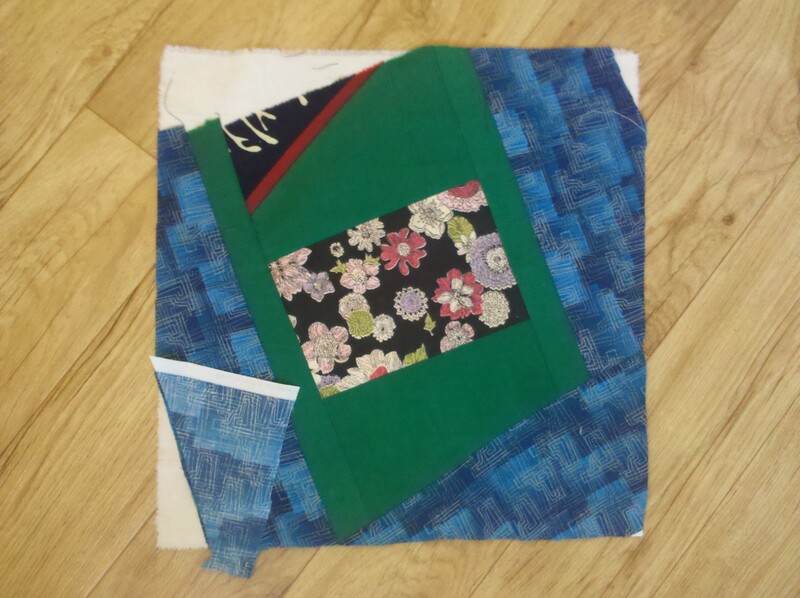 If you would like more hands-on practice and you are in the greater Bay Area, I’m teaching a Crazy Log Cabin Quilt Square class. 1A. 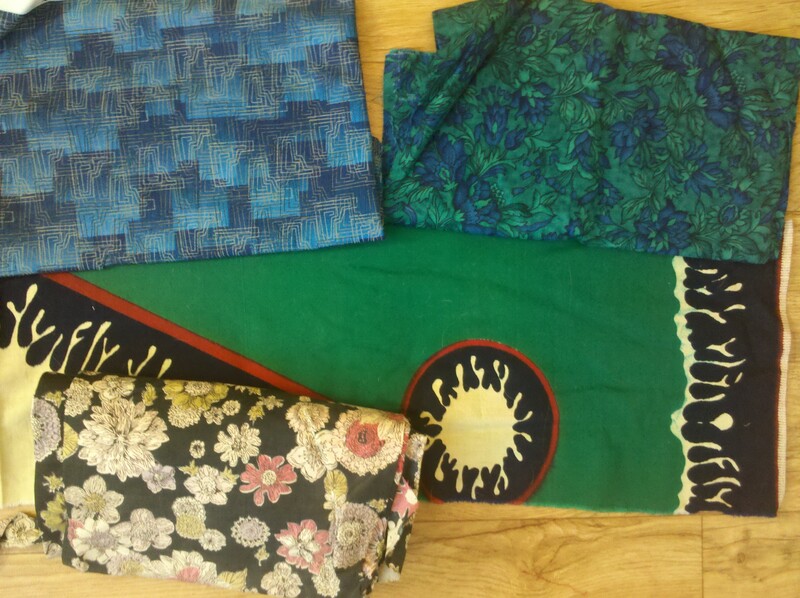 Choose some fabrics that you think look nice together. I always like to have at least some kind of accent or contrast color. 1B. When choosing fabrics, notice how the same colors look different depending on what colors or patterns they are next to. 2. 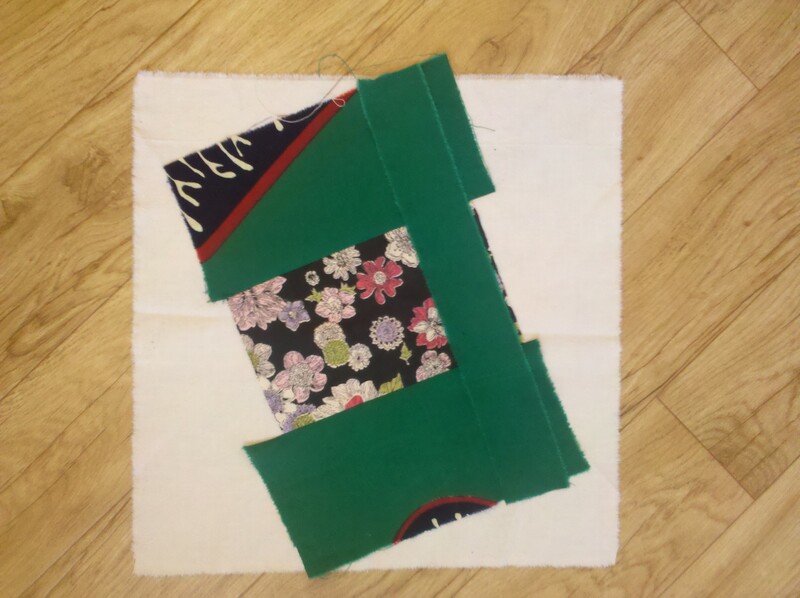 Start out with a square backing cloth, and place your center piece of fabric. 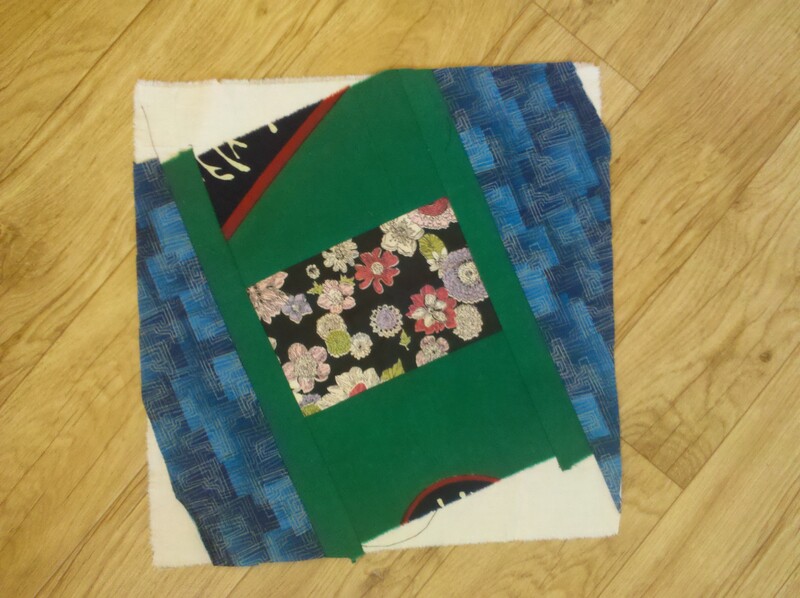 It is not attached to the backing fabric, but just resting there. 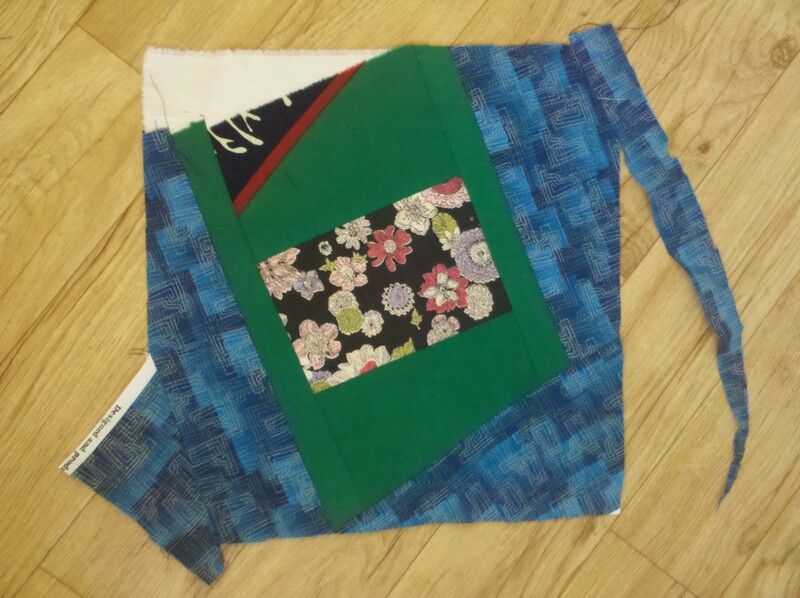 Notice I have placed the measuring tape along the lower edge, which is where I will start attaching the second fabric. 3. With right sides together, and the lower raw edge matched, sew a quarter of an inch from this raw edge, through all three layers of cloth. 4. This lower raw edge has been sewn through all three layers of fabric. 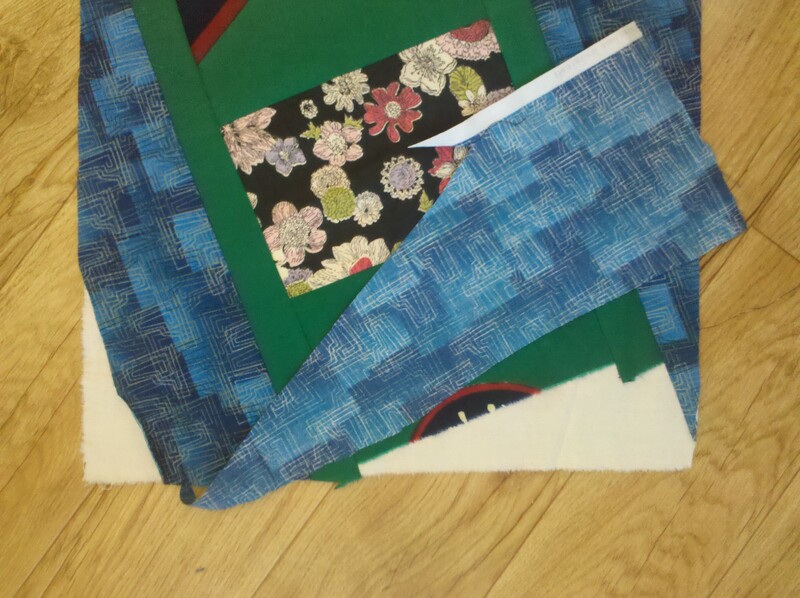 Be sure that the raw edge of the center piece fabric sticks out and all three layers of fabric have been sewn through. You want to be sure that the center piece fabric does not come loose later. 5. Open up the seam just sewn. Fold the green cloth back down, and press open with a very hot iron. 6. 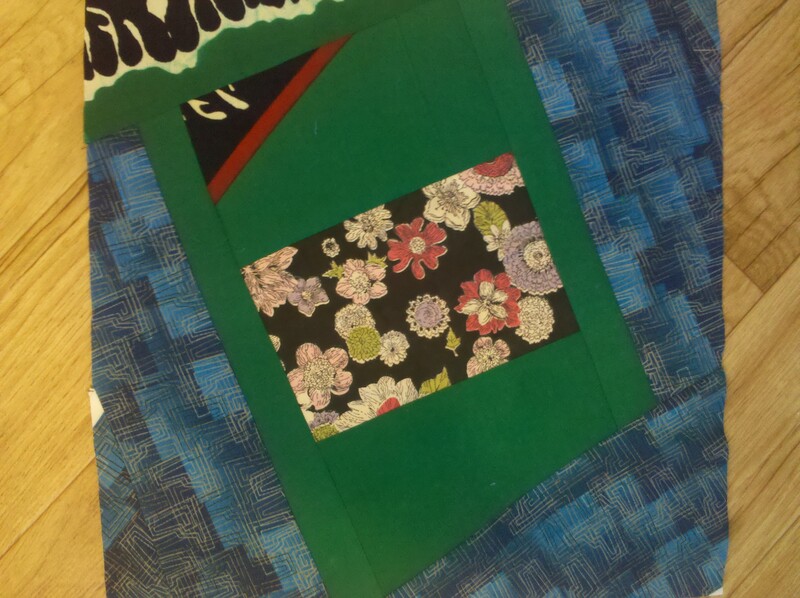 Follow the same procedure along the upper edge of the center piece fabric. 7. 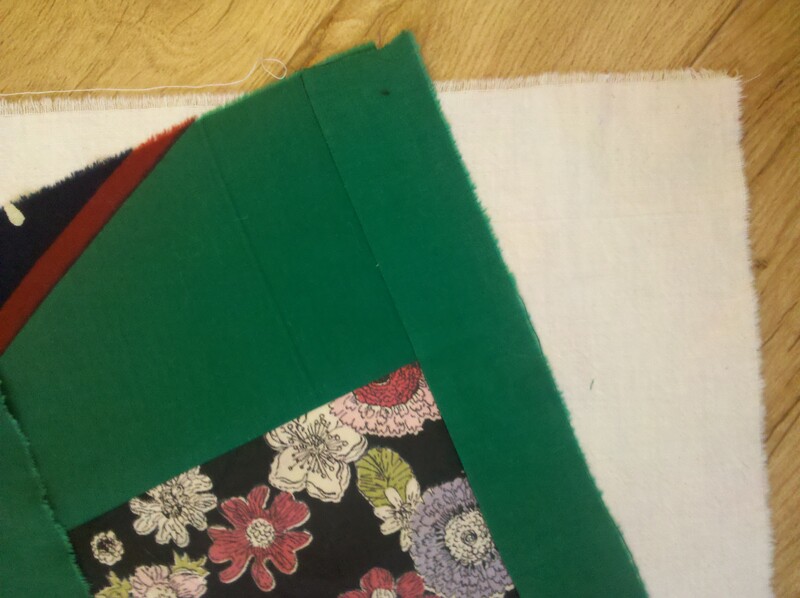 After sewing all three fabrics together, flip the fabric up, and press open with a hot iron for a clean seam. 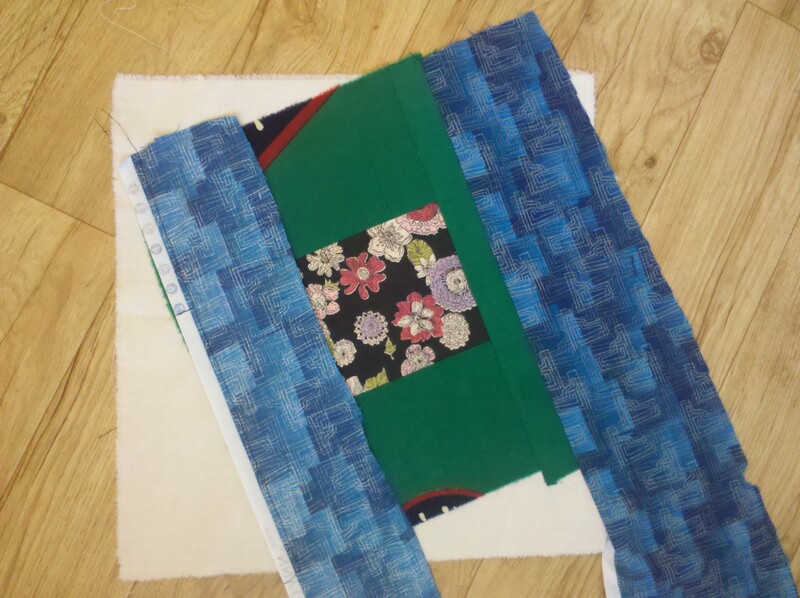 You now have the top and the bottom raw edges of the centerpiece fabric secured to the backing fabric. 8. Next you will need a strip of fabric that will cover the entire right side, and contain all of the raw edges on the right. It must be longer than the width of the first two green strips and center piece fabric. 9. 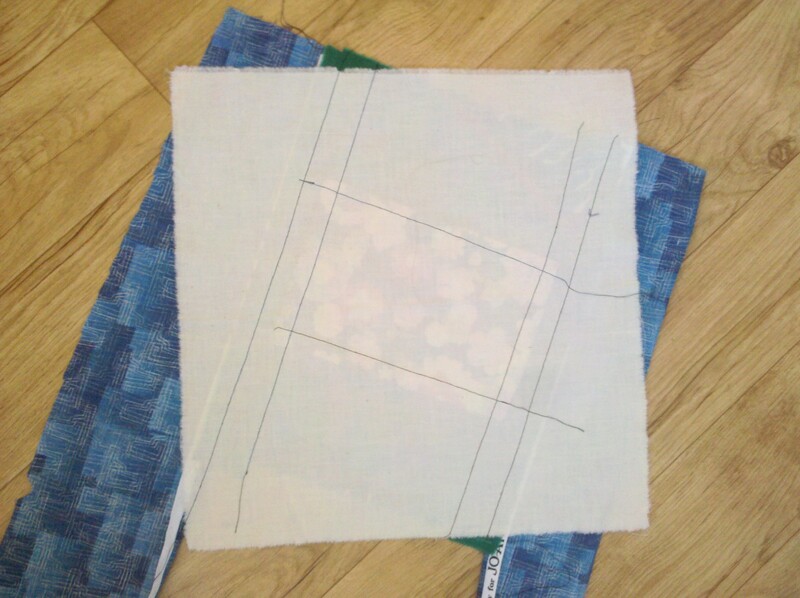 Place your third strip on top with right sides together. 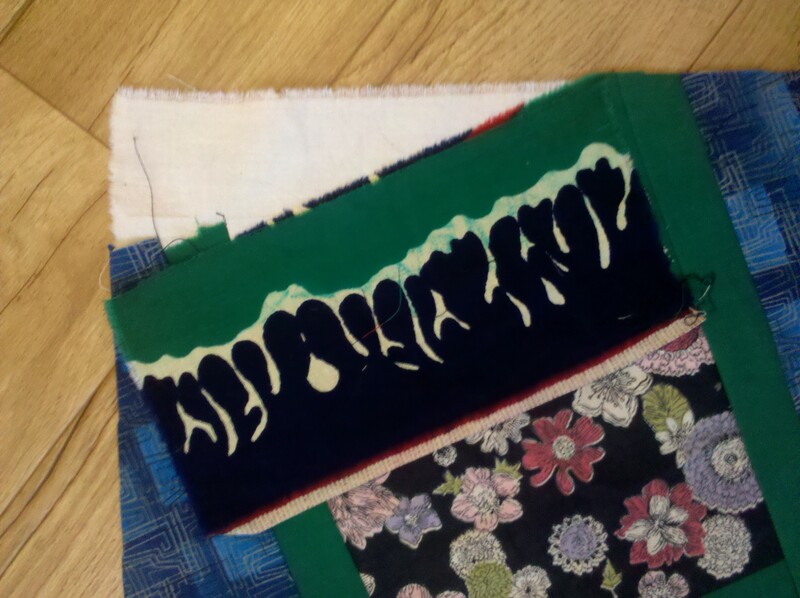 Notice that all the raw edges of the lower fabric stick out to the right, beyond the fabric you have just placed (the 3rd green strip.) 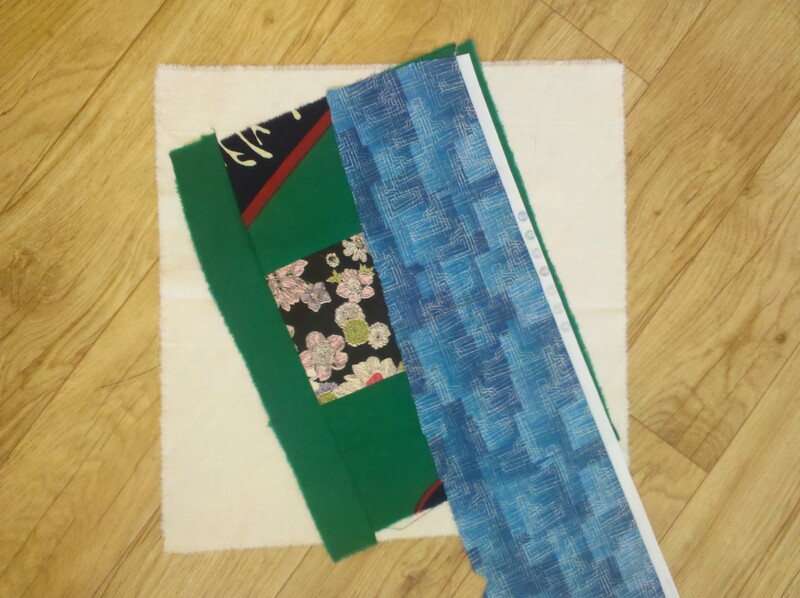 Also notice that the third strip is as long or longer than the other fabric below it. Stitch and press open to the right. 10. Follow the same procedure on the left edge. In this photo, the strip on the left is stitched down a quarter of an inch from the edge. 11. 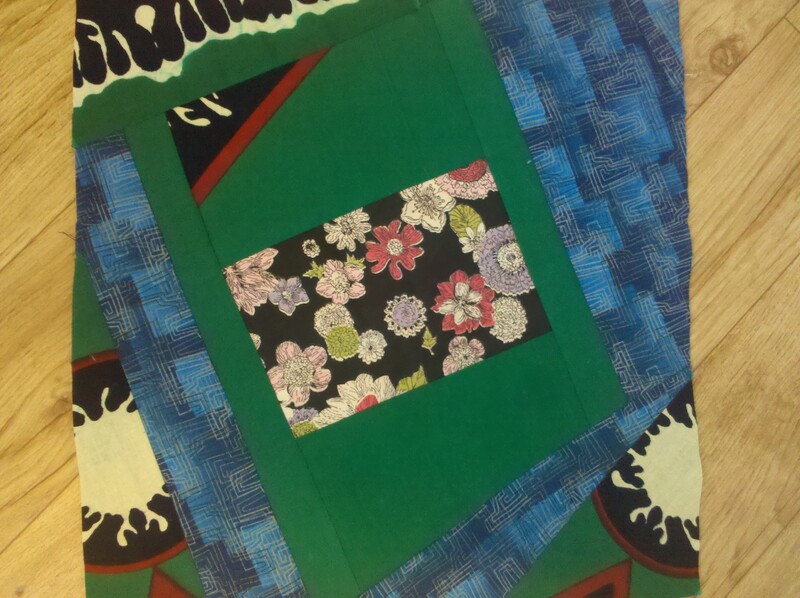 All of the seams have been pressed down smoothly, and there are no raw edges exposed from the center piece fabric. It is OK if there is some fabric going over the edge of the backing fabric, you will trim this off later. 12. 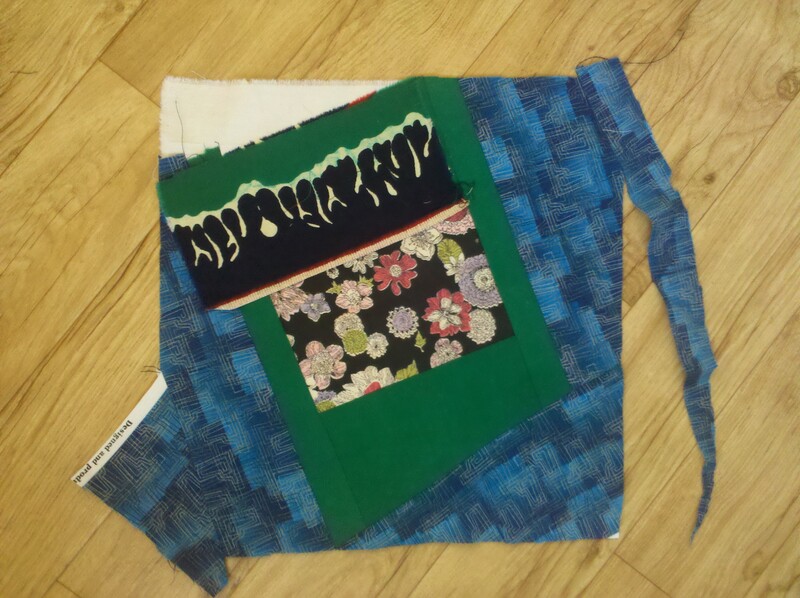 Again, notice that all of the lower level edges of fabric are visible to the left of the stitching, and when the fabric on top is folded to the left, this will contain any raw edges. 13. Fold fabric strip to the left and press with a hot iron. This is how it looks! You have mastered the basic process, and will repeat this process on all four edges with squares/trapezoids of your different color fabrics. 14. Now start with your next color. 15. You can start on any edge, again being sure that the lower fabric sticks out beyond the top layer, and each strip is longer than the width of those below it. 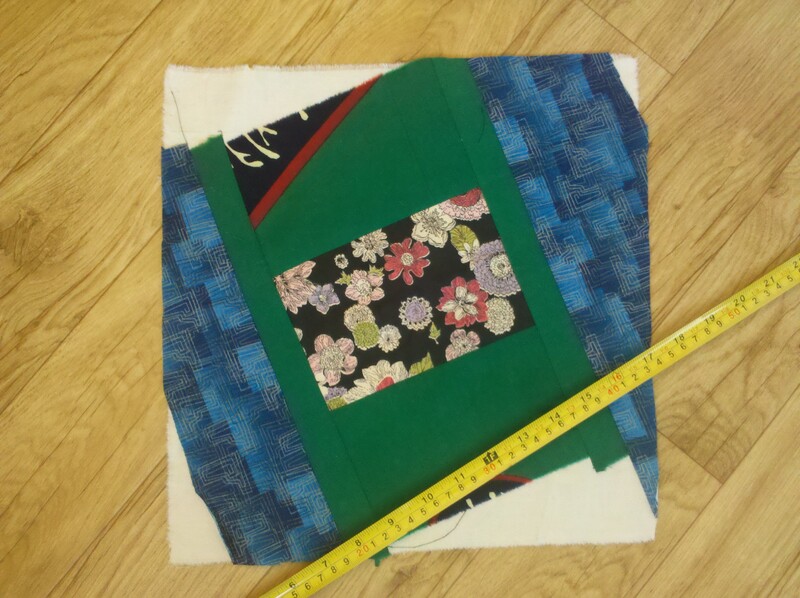 You will sew along this right edge, a quarter of an inch from the raw edges. 16. Fold the fabric down flat to the right and press with a hot iron. 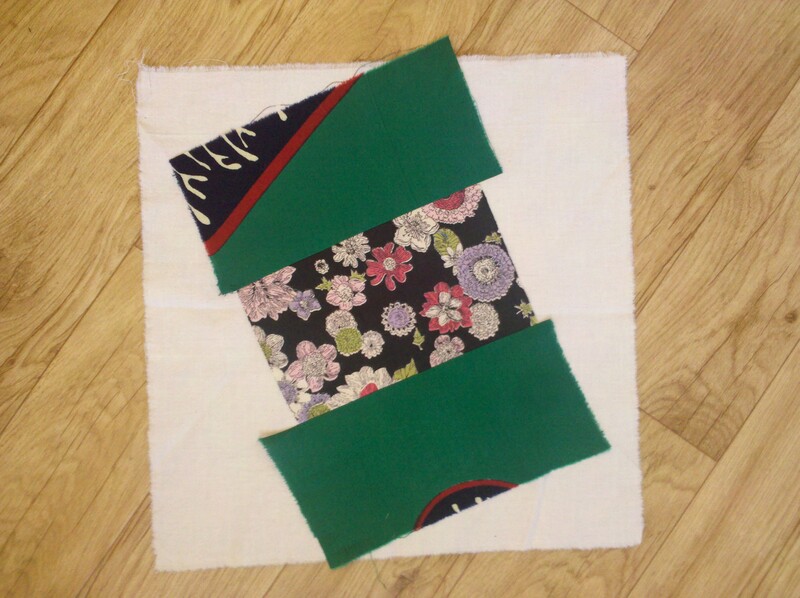 On the opposite side from what you have just sewn, place the next fabric strip. Sew along this edge, fold to the left, and press open with a very hot iron. 17. 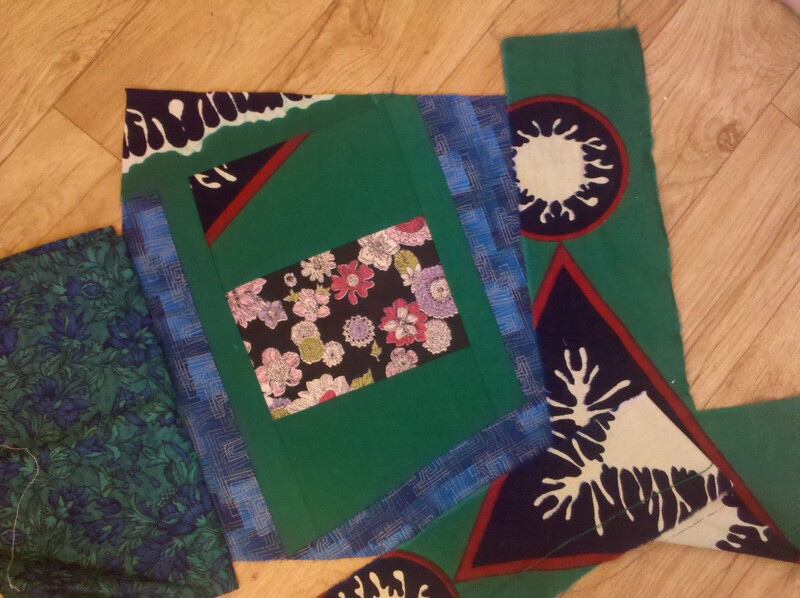 This is what the quilt square looks like from the back. 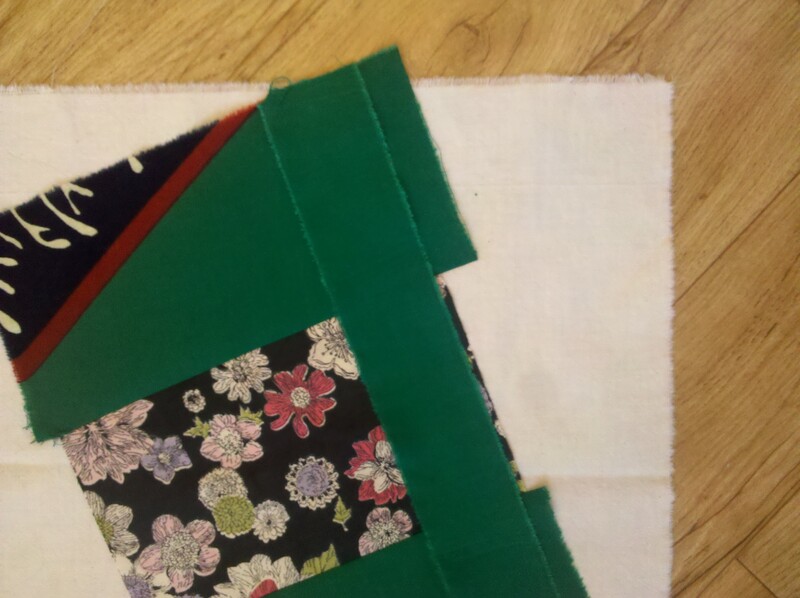 With muslin backing faced up, trim off the extra fabric that goes beyond the muslin. 18. 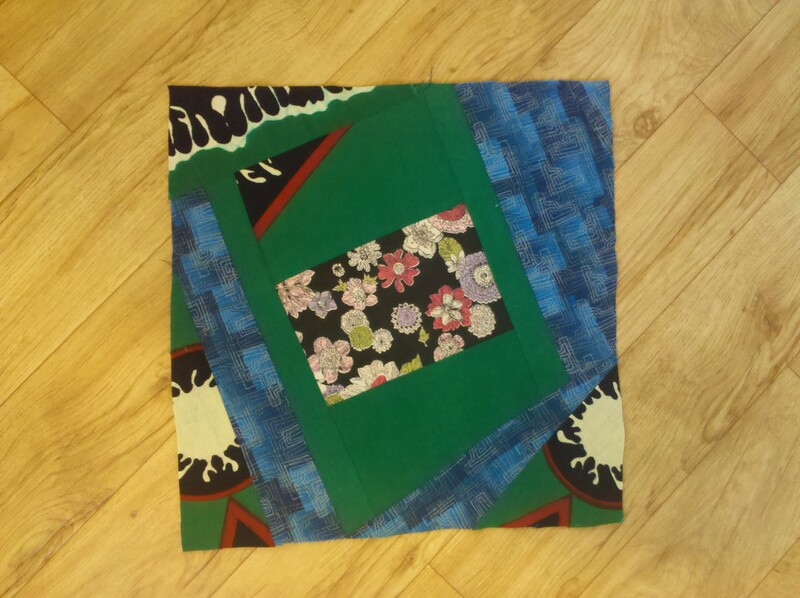 Right side up, this is how the trimmed quilt square looks. 19. Now only four corners of the muslin are showing. Please look at the lower right edge of the green square, with the small blue/red arc. 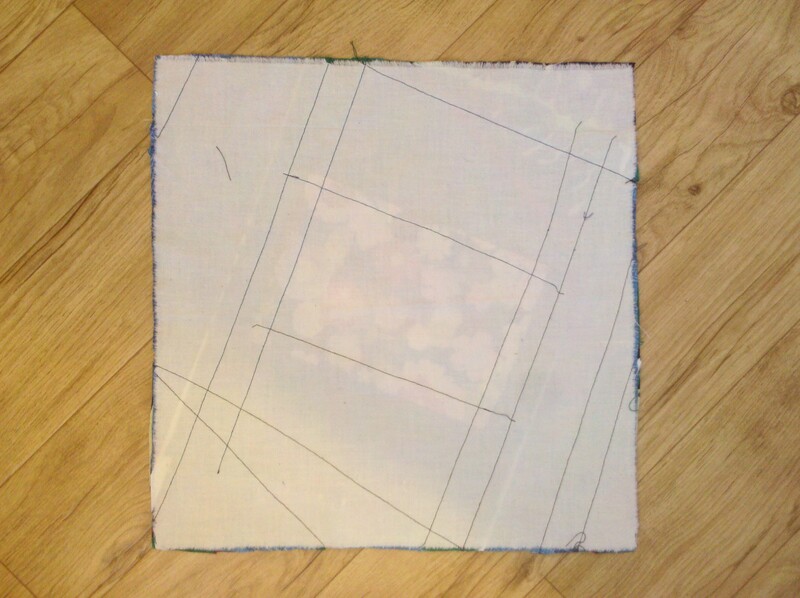 If you want to keep the green square a square, rather than a trapezoid or an angled square, your next line of stitching will be straight along the raw edges. 20. 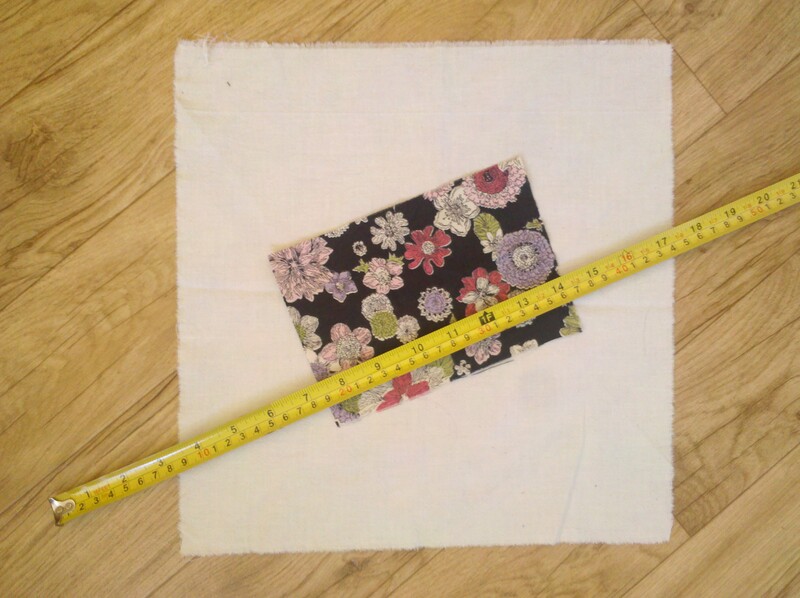 If you would like more of an angled square, your next line of stitching will be slightly angled, along the line of the tape measure. Again, be sure that all raw edges are secured. 21. 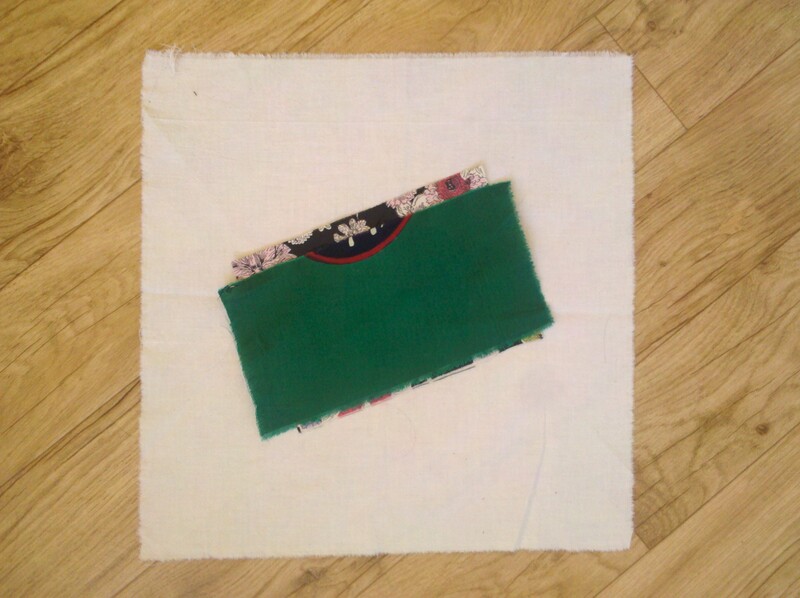 Place your next strip of fabric, stitch a quarter of an inch from the edge, press open with a very hot iron. 22. 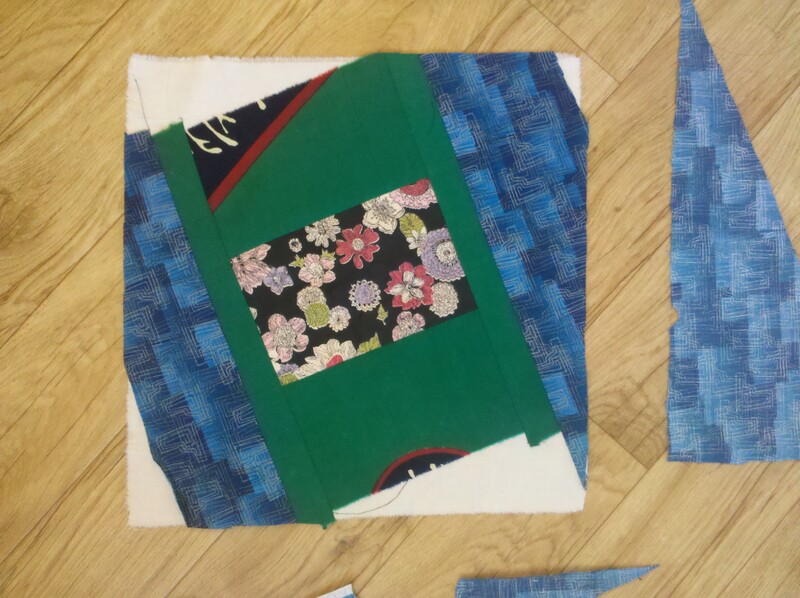 Notice the blue strip is angled, and it is fine if there is a lot of fabric sticking out beyond the line of stitching. 23. Press open with a very hot iron. 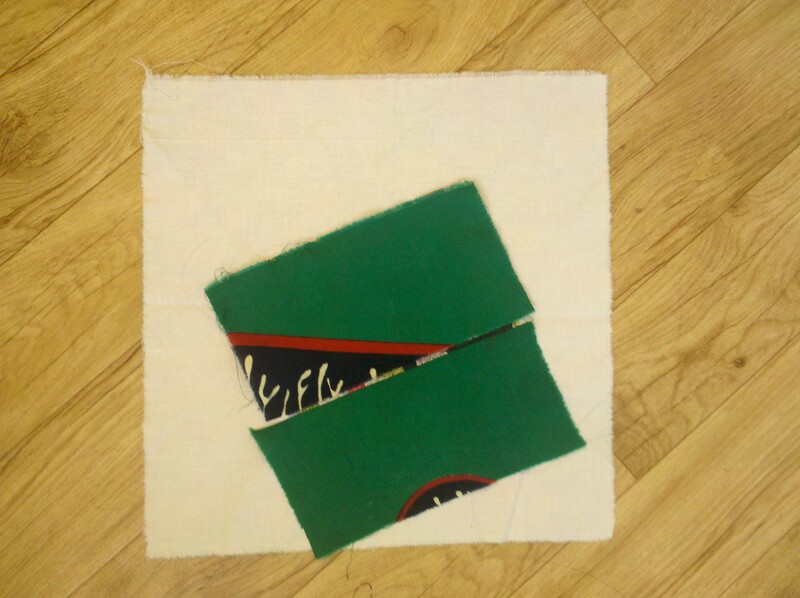 Because you angled the line of stitching, the green is now an angled square. 24. 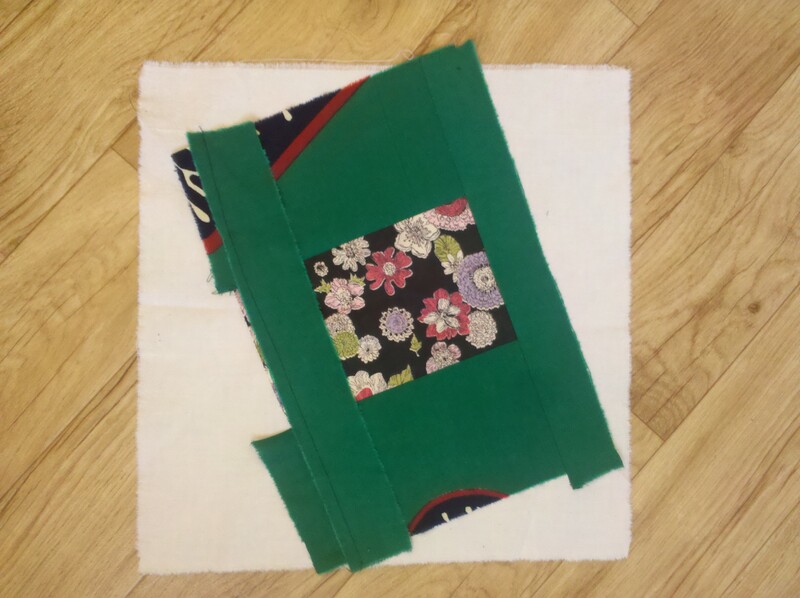 Flip the square over with the backing facing up and trim off any excess fabric. Now you are almost done! There are just three corners that have exposed muslin. 25. Follow the same procedure on the three remaining corners. 26. Stitch, press open with a very hot iron. 27. I could have used more of the blue fabric on the last corner, but I liked this green and blue fabric, so I’m using it instead. 28. 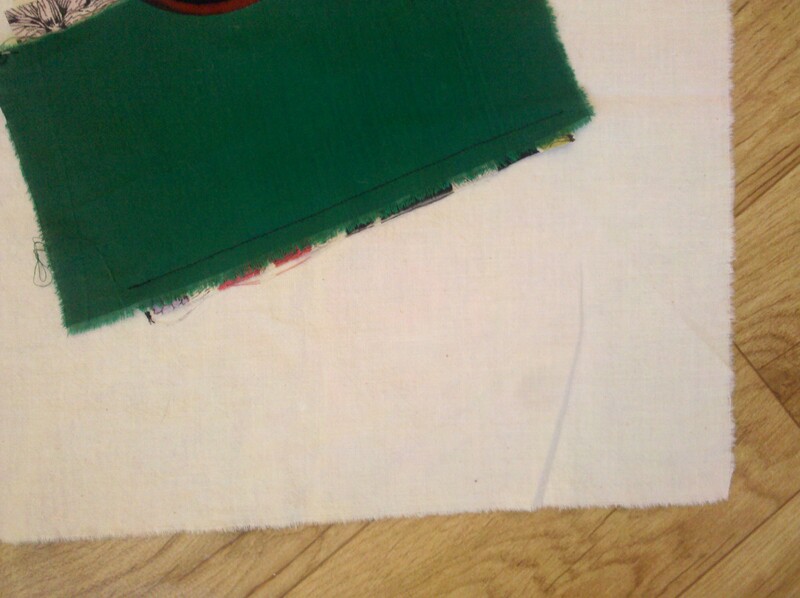 All under layer fabrics stick out beyond the top layer, and you will stitch a quarter of an inch below this raw edge. 29. Flip fabric strip over and press open seam with a hot iron. 30. Trim off any excess fabric. That’s it, you are now DONE! 31. This looks great! All stitching lines have been pressed open with a hot iron and the square lays flat without any wrinkles or bulges. 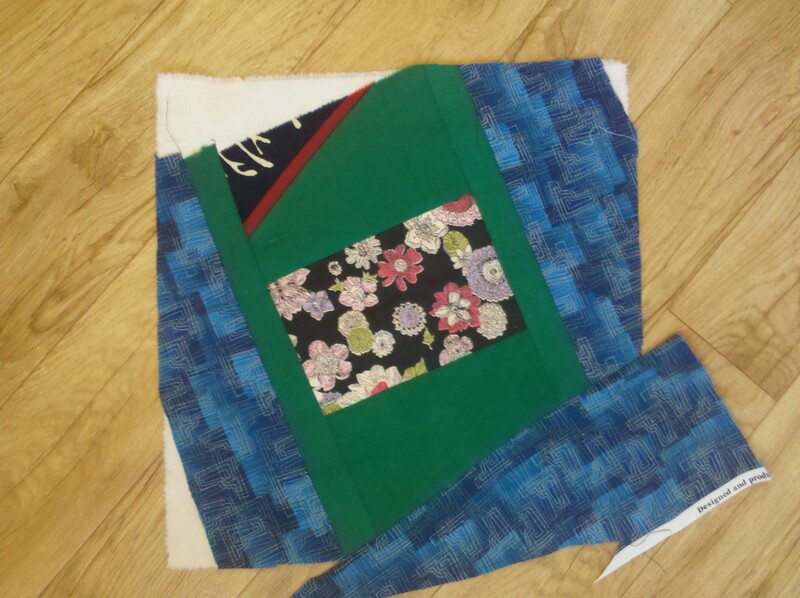 Quilt squares can be sewn together, or sewn to strips on all sides and attached together. 32. Now I’m looking at this square and I think it is missing something. It is fine the way it is, but it looks a little muddy and would be better with more accent or contrast, so I am going to add more to it. 33. I hold some cloth up to eyeball potential additions. I could add the green and blue fabric on the left. 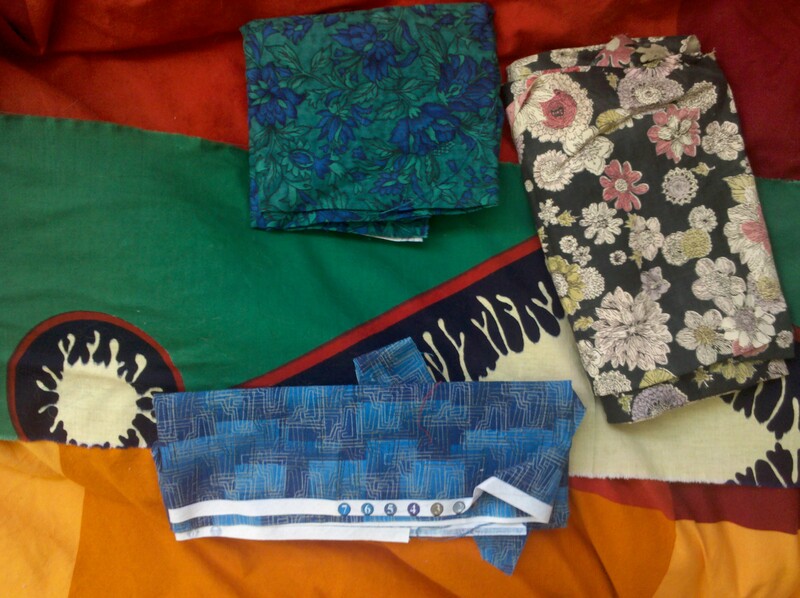 Or the geometric fabric on the right. I think the blue, red and white triangle on the lower right looks cool. 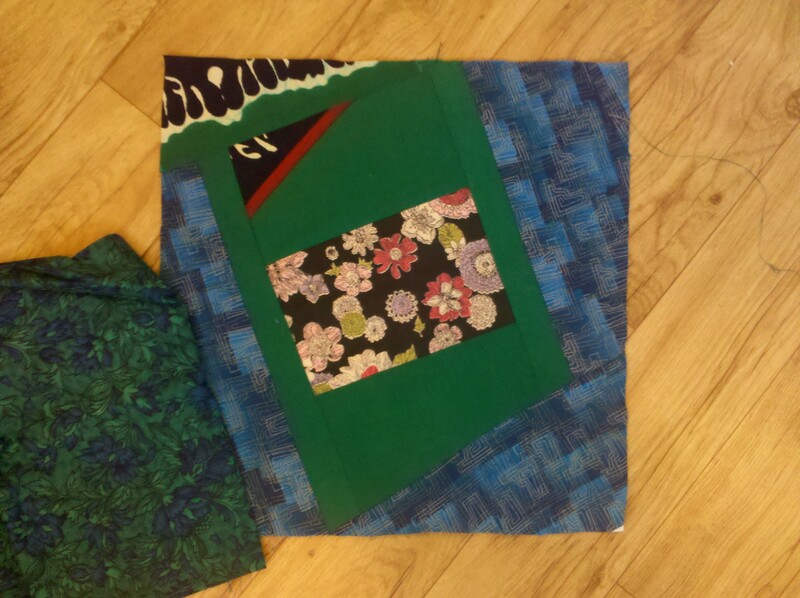 Both of these fabrics make the blue fabric pop out more and look brighter. 34. 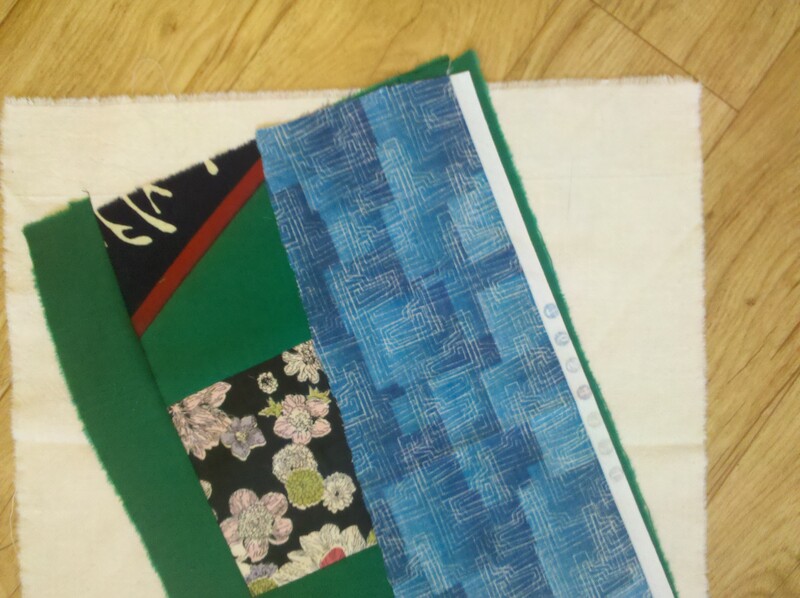 Let’s see… Green and blue fabric. 36. I choose the geometric fabric. The white blobs echo the floral pattern in the center, and the red is a nice accent that is consistent from the center to the edges. I stitch them down with the same procedure. This is the final result! 37. Close up looks good. 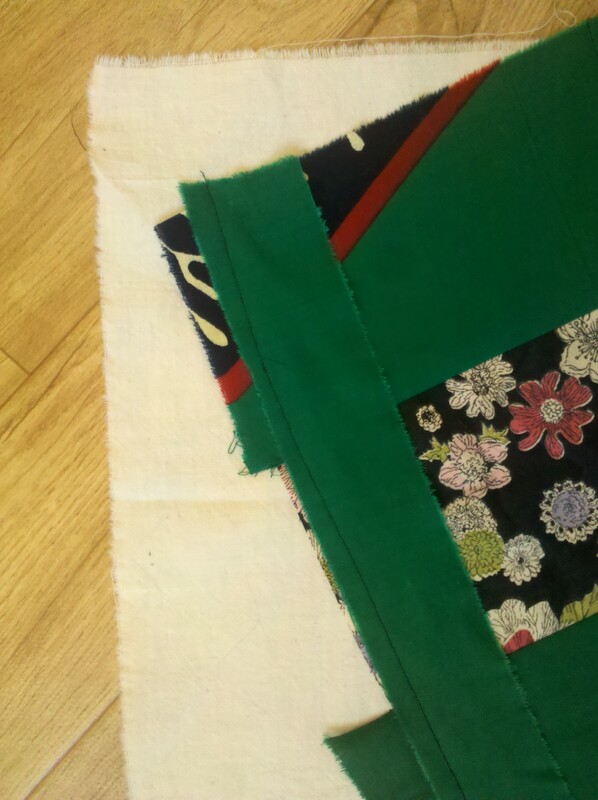 Clean and flat seams, no raw edges showing, threads clipped. 38. Trim any loose threads. 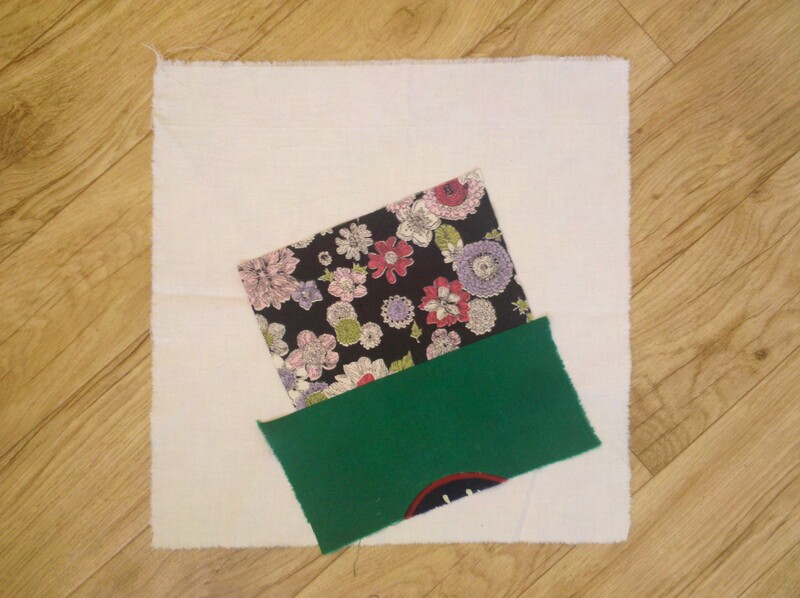 This is how the back of the quilt square looks. 39. The final result! 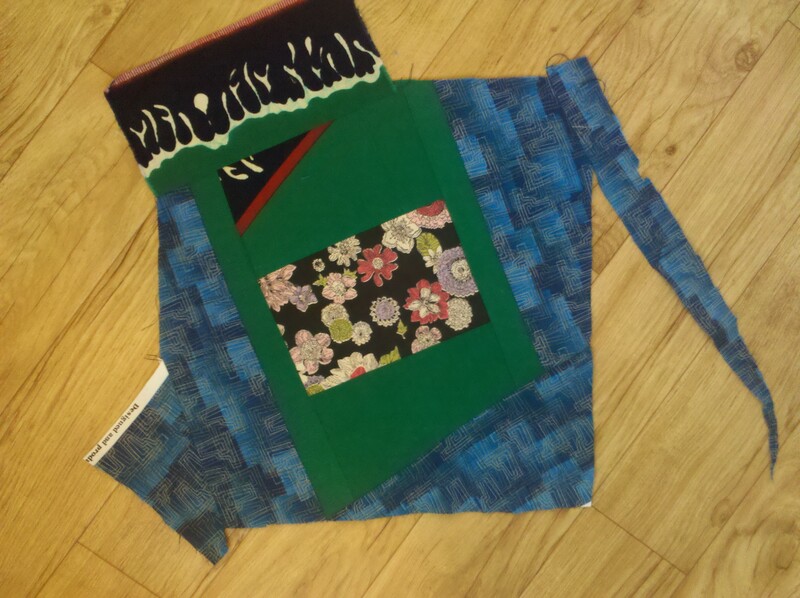 Fast and easy – and I’ve used up scraps to make something cool. 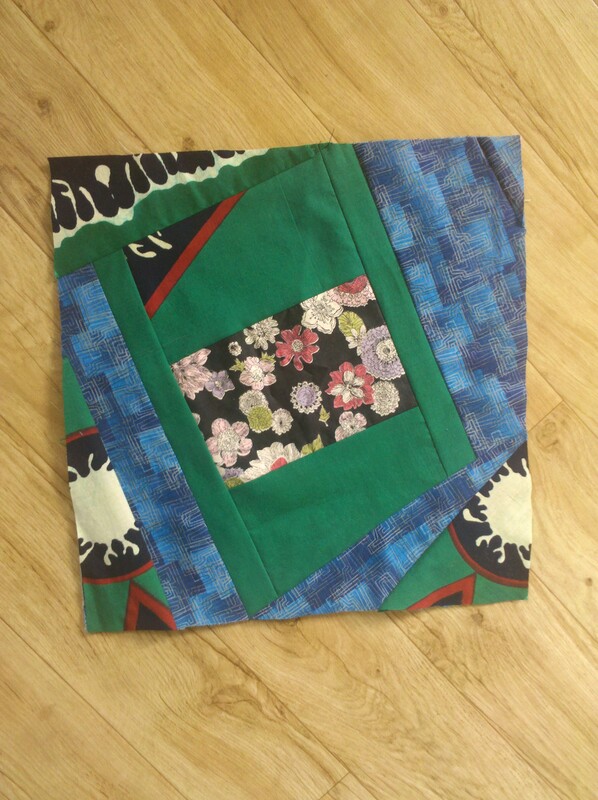 This entry was posted in Making Things and tagged crazy log cabin, easy, easy quilt tutorial, illustrated how-to guide, improvisational quilt, log cabin, quilt square, quilting, scrap, sewing, simple, tutorial, wonky. Bookmark the permalink.